Oat milk is a dairy-free milk alternative that is made from oats. It has a ratio of 1 cup of oats to ¾ cup of water. The mixture is then strained to create a liquid. According to https://www.livestrong.com, oat milk is a healthy alternative to whole milk and skim milk. It is rich in vitamin D, iron, calcium, potassium and fiber. One cup of store bought oat milk may have up to 120 calories, 5 grams of fat, 3 grams of protein, 14 grams of carbohydrate and 2 grams of fiber. Comparatively, cow’s milk contains 3.5% fat, 146 calories, 11 grams of carbohydrate, 8 grams of protein and 8 grams of fat and skim mild has 83 calories, 122 grams of carbohydrate, 0.2 grams of fat and 8 grams of protein. Even though the numbers for skim milk seem better than oat milk, skim milk still contains lactose. 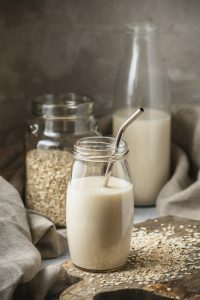 If you’d like to try your hand at making your own oat milk, here is a simple recipe from https://simpleveganblog.com that you may want to try. Soak the oats in water for at least 30 minutes or overnight. Drain the oats and wash them (discard the soaking water). Blend the oats with 3 – 4 cups of clean water. Strain the milk using cheesecloth, a strainer, a napkin or a nut milk bag. Store oat milk in a sealed container in the fridge for up to 5 days. Homemade oat milk reduces the risk of cross contamination with potential allergens at the manufacturer and can is less expensive to make than to purchase.